It could have gone with a bang ! On April 26 1909 a notice appeared in the East Anglian Daily Times. It was quite a small notice which could quite easily have been missed if not for the sharp eyes of two Wivenhoe residents. Namely Mr C E Gooch and Mr A K Barlow. It went on to say that anyone objecting must send in notice to clerk of the Councils and to Nitro Compounds, with notice of their intention to appear and object, and reasons for their objections, no less than seven days before the hearing. Just over a month away! Slightly short notice maybe? Well there appeared to be at least two objectors, Mr Gooch and Mr Barlow, who arranged a meeting to take place on 4 May, in the High St and a large crowd assembled outside the parish church. Mr Gooch shared his concerns, saying that he felt the proposed factory would be a serious detriment to the town. He felt that the matter was partially decided and until he saw the notice in the newspaper, was unaware of the proposal as he thought were many other people. He felt the matter had been dealt with in great secrecy. Mr Barlow and Mr Gooch stated that they had sent in their protest in the proper legal form. Mr Barlow had received a response from the company stating that they would come and explain the situation but up till the present time they had heard no further from the company. Mr Gooch went on to point out the dangers of having an explosives factory in the vicinity. It was to be constructed on the hilly field in the middle of Lower Park Farm which was only about half a mile from the greater part of the population of Wivenhoe and Rowhedge. 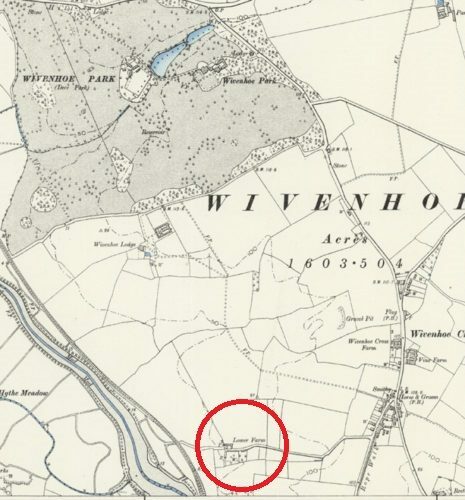 Mr Gooch pointed out that such factories had to be at a distance of four miles from a Palace occupied by a King or members of the Royal family, and if that was so why should they in Wivenhoe or Rowhedge be compelled to live within three quarters of a mile. As to the question of employment, an explosives factory in the area would not encourage other factories into the area. Only three hands, including those of Mr Gooch and Mr Barlow were held up in favour of the resolution and a large number were against the resolution. A number of people present voted neither for or against. Following this meeting the Urban Council arranged that two petitions should be placed for signature in the council offices to gain public opinion regarding the proposal for the factory. By the 22 May the petitions showed that the majority of signatures were in support of the factory. Only two signatures were against the proposal. On 29 May the petition would be handed to the justices when the factory proposal was put before them. At the Lexden and Winstree session on 29 May the proposal for the factory was put by Nitro Compound Co who stated there was no danger of explosions, the Wivenhoe public were in favour of the factory and there would be employment for 100-150 people. Alderman E J Sanders, chairman of the Colne Oyster Fisheries, said he regarded with the greatest apprehension any project for the erection of a factory from which there might be discharge of noxious fluid into the Colne or which might create any fear in the mind of the public that such discharge might take place. The bench refused the application. The barrister for Nitro Compounds intimated there may be an appeal to the Home Office. This page was added on 15/03/2018.